It’s no secret that Sean Hannity and Michael Savage have a bitter radio rivalry. That enmity only got fiercer when the pair became afternoon drive competitors earlier this year. 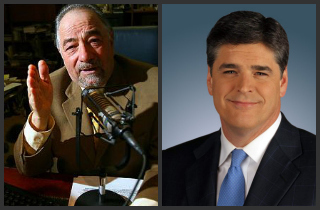 In their first month of competition (Jan. 2014), Savage pulled an upset, defeating Hannity in the key 25-54 demo in a handful of major radio markets. That surprising streak has been maintained, as Savage boasted today of a continued dominance in February 2014. The feud came to a hilt when it was announced Savage would take over Hannity’s timeslot after the latter’s split with Cumulus. Despite Savage’s first two months of demo victories, Hannity still defeats Savage in overall national listenership, finishing second only to Rush Limbaugh. We have reached out to Premiere Networks, the Clear Channel subsidiary that syndicates Hannity, for comment, but have yet to hear back. It’s puzzling that Michael Savage would want to brag about his listening audience. Despite his claims, the numbers show that Savage is losing the audience that he inherited from Sean Hannity in droves, on the radio stations that Sean spent 17 years building. In New York on WABC-AM as well as on Dallas on WBAP-AM, in the key demo of A25-54, Savage has lost a whopping 49% of the audience that he inherited from Sean Hannity. Meanwhile, Sean Hannity has more than doubled the total audiences where has started on new stations after leaving Cumulus in New York, Los Angeles, and Dallas. […] In total, the Sean Hannity Show airs on more than 500 radio stations nationwide, with an estimated audience of over 11 million listeners, while the Savage Nation airs on around 200 stations with an estimated audience of less than 3 million.